Join URMIA - University Risk Management and Insurance Association, Inc.
Just create an account on our website and answer a few questions. We'll make sure you get the right membership for you! Look for your organization on our list of Member Organizations. If your organization is a member, simply create an account on our website and answer a few questions to be added to your organization's membership. If you would prefer to contact us, we will be happy to get you signed up. College and university risk managers and administrators should apply for an Institutional membership. Employees of insurance companies, brokerages, or consultancies should apply for URMIA’s Affiliate membership. Students, professors, and retired risk managers qualify for one of our Individual member types. 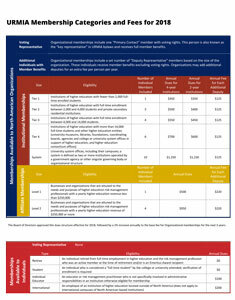 See the Comparison Chart for details.